A few months ago, when the A's announced their plans to hold a "Rickey Henderson Day" as part of a Rickey Weekend August 1 and 2, the plans included a "ceremony on the field" before the game. Since a ceremony without a purpose didn't make much sense, I made the prediction that they would also be retiring his number at the same time. This was followed with more evidence, with Kurt Suzuki changing number during spring training. 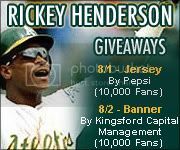 Although I still haven't seen a formal announcement, a received an e-mail today from the A's, promoting tickets and the giveaways to the upcoming Rickey Weekend. 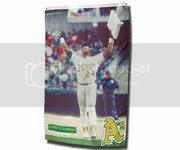 Below the box shown above, tucked on the side of the e-mail, was the following text: "Celebrate Rickey Henderson’s induction into the Hall of Fame with terrific promotional giveaways and retirement of #24 on Saturday, Aug. 1." The A's have also released pictures of the two giveaways for the weekend. 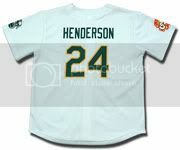 The Saturday, July 1 jersey giveaway is shown above. The jersey is sponsored by Pepsi, and limited to the first 10,000 fans. Looking at the picture, it actually looks like it's an Orange Crush, and not Pepsi logo that's included on the sleeve of the jersey. I've been eagerly awaiting the image of the banner giveaway, and am pleasantly surprised. The image is the same one that they used on their pocket schedules earlier in the year, and is a classic Rickey pose. Although sponsored by Kingsford Capital Management, their logo doesn't seem to actually appear on the design, which I guess is subject to change. Also limited to only 10,000 fans, I expect this to be a popular giveaway, and am planning on getting to the park pretty early that day so I don't miss out. SWEEET! I am so excited about going to those games! I only hope that the wife and I are two of the first 10,000! Hope to see you there! I'm even more excited now that they've officially announced that his number is going to be retired. We'll definitely see you there, and will all hopefully get there early enough for the giveaways! I had an "inkling" that was going to happen. They do that everytime someone has their number retired. I am glad it will happen. I'm going to both games and will be coming home from NY after watching Rickey get inducted into the Baseball Hall of Fame. I guess I'll be spending big bucks on eBay to land these giveaways soon....fun! Considering there will be 10,000 of them given away each day, the eBay prices shouldn't be too ridiculous. The first few listed will go pretty high, but they should become more reasonable after that.